From the bestselling author of The House at Riverton and The Secret Keeper, Kate Morton brings us her trademark mix of secrets, lies, and intricately layered mysteries in the The Clockmaker's Daughter. Read an extract from the book here. It was Elodie Winslow’s favourite time of day. Summer in London, and at a certain point in the very late afternoon the sun seemed to hesitate in its passage across the sky and light spilled through the small glass tiles in the pavement directly onto her desk. Best of all, with Margot and Mr Pendleton gone home for the day, the moment was Elodie’s alone. The basement of Stratton, Cadwell & Co., in its building on the Strand, was not an especially romantic place, not like the muniment room at New College where Elodie had taken holiday work the year she completed her master’s. It was not warm, ever, and even during a heatwave like this one Elodie needed to wear a cardigan at her desk. But every so often, when the stars aligned, the office, with its smell of dust and age and the seeping Thames, was almost charming. In the narrow kitchenette behind the wall of filing cabinets, Elodie poured steaming water into a mug and flipped the timer. Margot thought this precision extreme, but Elodie preferred her tea when it had steeped for three and a half minutes exactly. Denying Pippa was not easy. She was Elodie’s best friend and had been since the first day of Year 3 at Pineoaks primary school. Elodie often gave silent thanks to Miss Perry for seating the two of them together: Elodie, the New Girl, with her unfamiliar uniform and the lopsided plaits her dad had wrestled into place; and Pippa, with her broad smile, dimpled cheeks and hands that were in constant motion when she spoke. They’d been inseparable ever since. Primary school, secondary school, and even afterwards when Elodie went up to Oxford and Pippa to Central Saint Martins. They saw less of one another now, but that was to be expected; the art world was a busy, sociable place, and Pippa was responsible for a never-ending stream of invitations left on Elodie’s phone as she made her way from this gallery opening or installation to the next. The world of archives, by contrast, was decidedly un-busy. That is, it was not busy in Pippa’s sparkling sense. Elodie put in long hours and engaged frequently with other human beings; they just weren’t the living, breathing sort. The original Messrs Stratton and Cadwell had traversed the globe at a time when it was just beginning to shrink and the invention of the telephone hadn’t yet reduced reliance on written correspondence. So it was, Elodie spent her days communing with the foxed and dusty artefacts of the long dead, stepping into this account of a soirée on the Orient Express or that encounter between Victorian adventurers in search of the Northwest Passage. Elodie removed the teabag, squeezed the last drips into the sink and added a half-second pour of milk. She carried the mug back to her desk, where the prisms of afternoon sunlight were just beginning their daily creep; and as steam curled voluptuously and her palms warmed, Elodie surveyed the day’s remaining tasks. She had been midway through compiling an index on the younger James Stratton’s account of his 1893 journey to the west coast of Africa; there was an article to write for the next edition of Stratton, Cadwell & Co. Monthly; and Mr Pendleton had left her with the catalogue for the upcoming exhibition to proofread before it went to the printer. But Elodie had been making decisions about words and their order all day and her brain was stretched. Her gaze fell to the waxed-cardboard box on the floor beneath her desk. It had been there since Monday afternoon when a plumbing disaster in the offices above had required immediate evacuation of the old cloakroom, a low-ceilinged architectural after-thought that Elodie couldn’t remember entering in the ten years since she’d started work in the building. The box had turned up beneath a stack of dusty brocade curtains in the bottom of an antique chiffonier, a handwritten label on its lid reading, ‘Contents of attic desk drawer, 1966 – unlisted’. Finding archival materials in the disused cloakroom, let alone so many decades after they’d apparently been delivered, was disquieting and Mr Pendleton’s reaction had been predictably explosive. He was a stickler for protocol, and it was lucky, Elodie and Margot later agreed, that whoever had been responsible for receiving the delivery in 1966 had long ago left his employ. The timing couldn’t have been worse: ever since the management consultant had been sent in to ‘trim the fat’, Mr Pendleton had been in a spin. The invasion of his physical sphere was bad enough, but the insult of having his efficiency questioned was beyond the pale. ‘It’s like someone borrowing your watch to tell you the time,’ he’d said through frosted lips after the consultant had met with them the other morning. In the days since, she’d been careful to keep it concealed so as not to trigger another eruption, but now, alone in the quiet office, she knelt on the carpet and slid the box from its hiding place . . The pinpricks of sudden light were a shock, and the satchel, pressed deep inside the box, exhaled. The journey had been long, and it was understandably weary. Its edges were wearing thin, its buckles had tarnished, and an unfortunate musty odour had staled in its depths. As for the dust, a permanent patina had formed opaquely on the once-fine surface, and it was now the sort of bag that people held at a distance, turning their heads to one side as they weighed the possibilities. Too old to be of use, but bearing an indefinable air of historic quality precluding its disposal. The satchel had been loved once, admired for its elegance – more importantly, its function. It had been indispensable to a particular person at a particular time when such attributes were highly prized. Since then, it had been hidden and ignored, recovered and disparaged, lost, found and forgotten. Now, though, one by one, the items that for decades had sat atop the satchel were being lifted, and the satchel, too, was resurfacing finally in this room of faint electrical humming and ticking pipes. Of diffuse yellow light and papery smells and soft white gloves. At the other end of the gloves was a woman: young, with fawn-like arms leading to a delicate neck supporting a face framed by short black hair. She held the satchel at a distance, but not with distaste. Her touch was gentle. Her mouth had gathered in a small neat purse of interest and her grey eyes narrowed slightly before widening as she took in the hand-sewn joins, the fine Indian cotton and the precise stitching. Open me, the satchel urged. Look inside. Once upon a time the satchel had been shiny and new. Made to order by Mr Simms himself at the royal warrant manufactory of W. Simms & Son on Bond Street. The gilt initials had been hand-tooled and heat-sealed with enormous pomp; each silver rivet and buckle had been selected, inspected and polished; the fine-quality leather had been cut and stitched with care, oiled and buffed with pride. Spices from the Far East – clove and sandalwood and saffron – had drifted through the building’s veins from the perfumery next door, infusing the satchel with a hint of faraway places. Open me . . .
Open me, open me, open me . . .
Elodie rested the contents on her lap and set the satchel to one side. It was a beautiful piece that did not fit with the other items she’d taken from the box. They had comprised a collection of rather humdrum office supplies – a hole punch, an ink well, a wooden desk insert for sorting pens and paperclips – and a crocodile leather spectacle case, which the manufacturer’s label announced as, ‘The property of L. S-W’. This fact suggested to Elodie that the desk, and everything inside, had once belonged to Lesley Stratton-Wood, a great-niece of the original James Stratton. The vintage was right – Lesley Stratton-Wood had died in the 1960s – and it would explain the box’s delivery to Stratton, Cadwell & Co. The satchel, though – unless it was a replica of the highest order – was far too old to have belonged to Ms Stratton-Wood; the items inside looked pre-twentieth century. A preliminary riffle revealed a monogrammed black journal (E. J. R.) with a marbled fore-edge; a brass pen box, mid-Victorian; and a faded green leather document holder. There was no way of knowing at first glance to whom the satchel had belonged, but beneath the front flap of the document holder, the gilt-stamped label read, ‘James W. Stratton, Esq. London, 1861’. The document holder was flattish and Elodie thought at first that it might be empty; but when she opened the clasp, a single object waited inside. It was a delicate silver frame, small enough to fit within her hand, containing a photograph of a woman. She was young, with long hair, light but not blonde, half of which was wound into a loose knot on the top of her head; her gaze was direct, her chin slightly lifted, her cheekbones high. Her lips were set in an attitude of intelligent engagement, perhaps even defiance. Elodie felt a familiar stirring of anticipation as she took in the sepia tones, the promise of a life awaiting rediscovery. The woman’s dress was looser than might be expected for the period. White fabric draped over her shoulders and the neckline fell in a V. The sleeves were sheer and billowed, and had been pushed to the elbow on one arm. Her wrist was slender, the hand on her hip accentuating the indentation of her waist. The treatment was as unusual as the subject, for the woman wasn’t posed inside on a settee or against a scenic curtain as one might expect in a Victorian portrait. She was outside, surrounded by dense greenery, a setting that spoke of movement and life. The light was diffuse, the effect intoxicating. Elodie continued to leaf carefully through the pages, each one filled with cross-hatched artist’s studies with occasional rough-sketched facial profiles in the margins. This sketch was more elaborate than the others, more complete. A river scene, with a tree in the foreground and a distant wood visible across a broad field. Behind a copse on the right-hand side, the twin-gabled roofline of a house could be seen, with eight chimneys and an ornate weathervane featuring the sun and moon and other celestial emblems. The words came to her then as clear as birdsong at dawn: Down the winding lane and across the meadow broad, to the river they went with their secrets and their sword. And she remembered. It was a story that her mother used to tell her. A child’s bedtime story, romantic and tangled, replete with heroes, villains and a Fairy Queen, set in a house within dark woods encircled by a long, snaking river. The wall clock chimed, low and premonitory, from Mr Pendleton’s office, and Elodie glanced at her watch. She was late. Time had lost its shape again, its arrow dissolving into dust around her. With a final glance at the strangely familiar scene, she returned the sketchbook with the other contents to its box, closed the lid, and pushed it back beneath the desk. 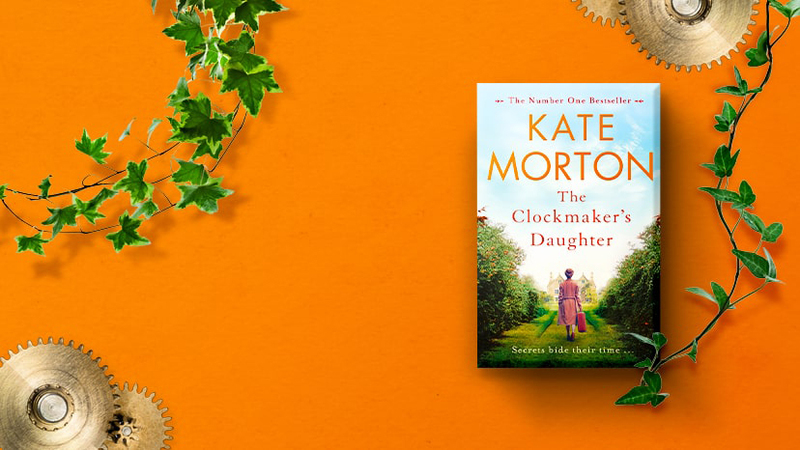 A mesmerising mix of secrets, lies and intricately layered mysteries, The Clockmaker's Daughter is bestselling author Kate Morton's sixth novel.